Updated 2/7/2018: Please realize that this article is speculative and contains my theories and ideas on the nature of the upcoming IDW Sonic the Hedgehog comic. With the official solicitations now out and information continuing to trickle in from IDW, we now have a pretty good idea what direction they will be taking Sonic and friends! Leading up to the release of Sonic Forces, SEGA tagged Ian Flynn and Adam Bryce Thomas, to do a series of short digital comics to promote the newest game. Although never officially confirmed to tie-in with the upcoming ongoing series being developed by IDW and SEGA, it now seems apparent that these comics served as a test run for what is to come. These comics helped establish that it was indeed a new era for Sonic comics on top of serving as a prequel to Forces and helping to flesh out the characters and their motivations ahead of the game’s release. What is most interesting to me, is that throughout all four issues, although mentioned, Sonic never makes an appearance at all. Instead they focused on fleshing out the supporting characters and world building. Through the four short issues, we see everything from a nameless, rank and file soldier find his courage alongside the veteran Chaotix, time traveling weirdness with Silver and Knuckles, the origins of Infinite with Dr. Eggman, to Team Shadow executing a “stealth” mission. In so few pages, Flynn manages to establish a new dynamic world ripe for expansion. Pair that with Thomas’s strikingly clean art style and you have an intriguing world with exciting new possibilities around every corner! With the stage set, you are able to jump into the action yourself as Modern and Classic Sonic, as well as your own custom avatar AKA “The Rookie” in Sonic Forces! Without spoiling things, Dr. Eggman is back once more with a new living weapon created by the mysterious Phantom Ruby, the Jackal mercenary now dubbed Infinite. When Sonic is defeated and captured, Eggman finally manages to conquer the world. In turn, Knuckles forms The Resistance to strike back. As one might expect, in the end our heroes are once again victorious and begin to rebuild after Eggman’s defeat, disbanding the Resistance in lieu of a time of peace. But if the solicitations for IDW’s ongoing series are any indication, Eggman is not about to give up that easily! While the others rebuild, Sonic travels around the world defeating the remaining pockets of Badniks still terrorizing remote towns and villages. In the first four issues, he will be joined on his tour by several allies, old and new alike, including: Tails, Amy Rose, Knuckles, Blaze, and Tangle! However, it is issue #2 that seems to indicate that we are entering into a post-Forces timeline. The solicitation reveals that Amy Rose has an agenda for meeting up with Sonic: Rejoin the Resistance! This paired with Adam Bryce Thomas’s alternate cover featuring the pair surrounded by Egg Pawns with designs a la Forces, and Eggman’s Death Crab ominously blocking out the sun, only reinforces this theory. Despite old talent making us feel back at home, as promised, IDW is going in an all new direction with this book. I am perhaps most excited to see Sonic receive a blank slate without the painful retconning of long-established characters and gutting years of world building. While the Archie series used SatAM as a strong template for world building, the Genesis Wave retcons freed Archie from certain legal perils, but left the comics in a somewhat nebulous and disjointed place despite Flynn’s best efforts. As far as a new basis for world building goes and regardless the game’s mixed reviews, the world established in Sonic Forces will provide perhaps the best available template moving forward. Firstly, it has established a simple, straightforward conflict between the Eggman Army and the Resistance that is somewhat analogous to the old Freedom Fighters without feeling derivative or low effort. 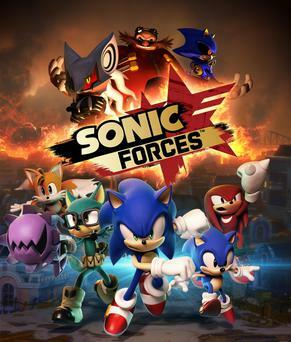 The tone set in Forces seems significantly more dark and desperate than that of SatAM. This conflict provides the axis on which the main drama can unfold and evolve as it explores all the nuances of such a world. It also incorporates classic game characters that can essentially be spiritual successors to their Archie counterparts thanks to many of the old creative team realigning with IDW. Likewise, it offers an opportunity to better utilize new or neglected characters, villains in particular, that were not as well-developed as some of Archie’s original villains (Scourge, Mammoth Mogul, Kodos, etc.). Infinite is potentially one of the more interesting villains to arise from a Sonic game in a long time, and showing that Metal Sonic, Chaos, Zavoc (presumably the rest of the Deadly 6 as well), and Shadow exist together in this world provides a lot of potential conflict in the future. Perhaps the most important aspect is that it makes room for brand new characters to be established in their own right, like Tangle, as well as the yet to be revealed villainous duo, Rough and Tumble. To me, it is extremely encouraging to see original characters, aligned with SEGA’s expectations, being thrown into the mix so early. It makes things seem much more fresh and exciting and is complimentary to the theme of a global struggle against Eggman drawing all kinds of individuals to the fight for their own personal reasons. This is a theme Flynn was developing with the Egg Bosses before Archie’s sudden cancellation that I hope to see more of the same in the new book. In summation, being set in the world of Forces, gives the book a solid foundation from which to build, and provides plenty of room for world building and character development. With so many fan favorites back on board and with creative room to breathe under a new license, I am confident Sonic will get a good start off the blocks with IDW as he races into the future! But what do you think? Did you like the story from Sonic Forces? Do you think it fits as a strong starting point for the new book? Are you happy to see a fresh start for Sonic and his friends? Let us know in the comments below! Next Issue #3 Cover Revealed in Previews! The story of Forces was good, but Classic Sonic did not need to be here, as he weakens the story and was added only for gameplay reasons. However, Infinite has a lot of potential as a new villain. And the adventures and struggles of the resistance in post-Forces look to be exciting. I just hope that they don’t shove in Classic Sonic in the comic, as he was added in the game for gameplay and marketing reasons only. Let Modern Sonic have an adventure of his own, in his timeline, with his friends. Not Tails spending time with Classic Sonic instead of Modern Sonic. Absolutely agree, I wish there was just Sonic, plain and simple. I don’t think they will show-horn “Classic Sonic” into the comic thankfully.